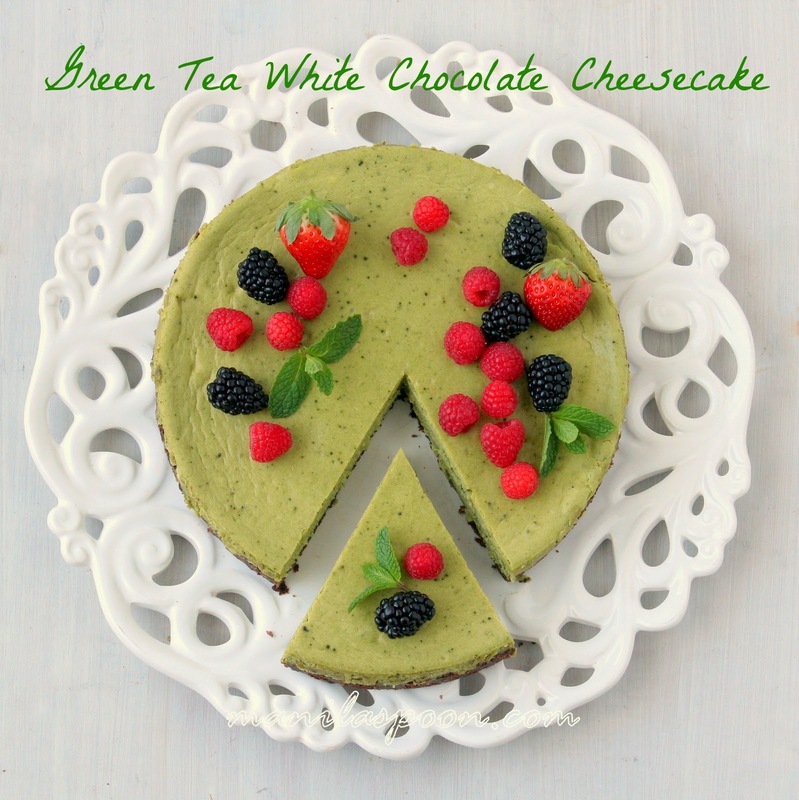 A rich and luxurious GREEN TEA WHITE CHOCOLATE CHEESECAKE with a subtle hint of green tea and the yummy flavor of white chocolate! The past few months, I have joined with some very talented bloggers to come up with recipes that suit a particular food theme. 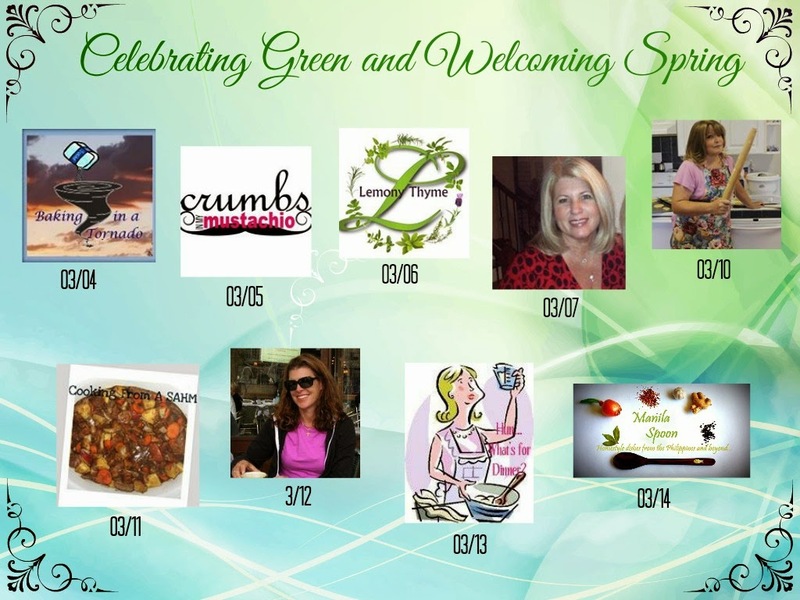 Each blogger gets the chance to pick a theme for a month that she is assigned. So when my turn came in March, I picked the color Green not only because it symbolizes the coming of Spring but also because I had this cheesecake in mind. 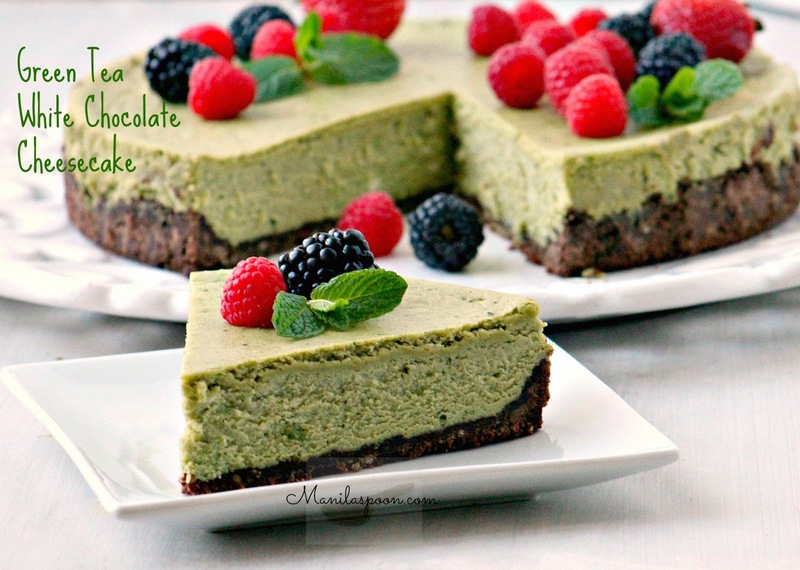 The challenge was to use a naturally green-colored ingredient in a recipe. I knew from day one that this would be mine. Without further ado, Let’s Celebrate Green and Welcome Spring with this luxuriously delicious Green Tea and White Chocolate Cheesecake! MAPLE POACHED PEAR SALAD WITH WALNUT CRUSTED GOAT CHEESE by Hun, what’s for dinner? and yours truly, Manila Spoon. Click on the above icon for printing. To delete the photo, simply click each image and it would be removed. Heat the oven to 300 F. Butter a 9-inch springform pan and line it with a circled parchment paper. To make it easier to remove the cheesecake from the springform pan later – turn the removable base of the springform pan upside down. Do this before you add the crumb crust. This way the crumbs won’t stick into the groove inside the pan. It would be easier to slide them onto a cake pan this way, too. Pulse the chocolate graham crackers in a food processor or use a rolling pin to crush them to make coarse crumbs. Combine the melted butter, crushed grahams and sugar in a bowl and mix until evenly moistened. Press the crumb mixture into the springform pan using the smooth bottom of a glass. Spread the crumb mixture to about 1/2-inch up the sides. Use the glass to help you form the side crust, too. Bake for 10 minutes. Set aside. In a heat-proof bowl over barely simmering water, melt the white chocolate and butter. Stir occasionally. Let it cool for a couple of minutes afterwards. In a mixer fitted with a paddle attachment, mix the softened cream cheeses until smooth and fluffy, scraping down the sides to eliminate lumps. Add the sugar and mix until smooth. With the mixer running, add the eggs one at a time, mixing well each time to ensure eggs are well-incorporated. Pour in the heavy cream and melted chocolate and add the green tea powder, mixing them all until smooth and green tea is well-blended, scraping down the sides a few times, if needed. There may be a spot of green tea here and there but that’s fine. Transfer the mixture to the prepared pan. Increase the oven temperature to 325F. Place the pan in a larger baking pan. Fill that with hot water halfway up the side of the springform pan. Bake for 1 hour and 10 minutes. Remove to a rack and let cool in the pan completely. Refrigerate overnight. I suggest making this 2 days ahead to develop more flavor. After 2 days the green tea taste would have mellowed down and provides a nice contrast to the white chocolate. It would just be the perfect balance of flavor by then. 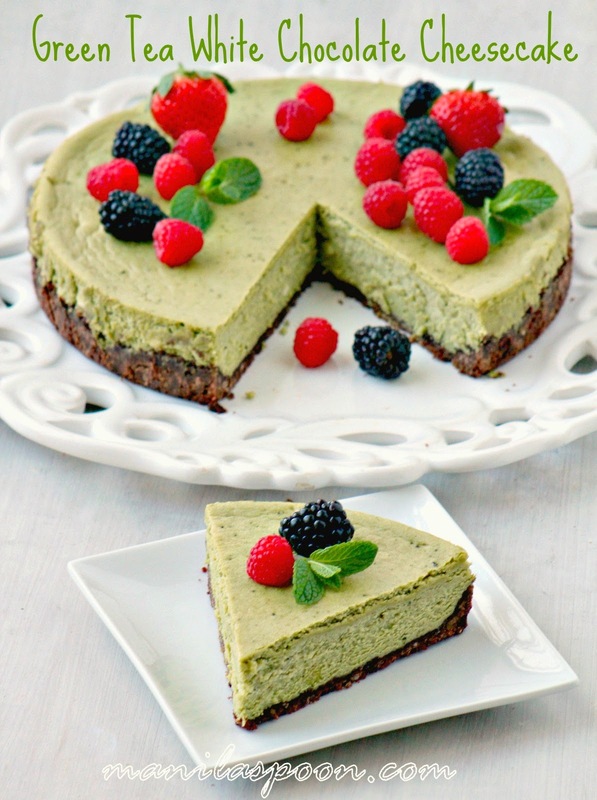 A subtle hint of green tea and then the sweetness of the chocolate plus the creaminess of the cheese all harmoniously work together to form such a wonderfully luscious and extraordinary cheesecake! Serve this with some fresh berries as they complement the cheesecake very well. Beautiful cheesecake. I love the balance of the white chocolate and the green tea. Pinning this! Thank you so much, Karen. This is truly an amazing cheesecake. Glad you stopped by. Please enjoy Annarita and please let us know how it goes. Thanks for stopping by. 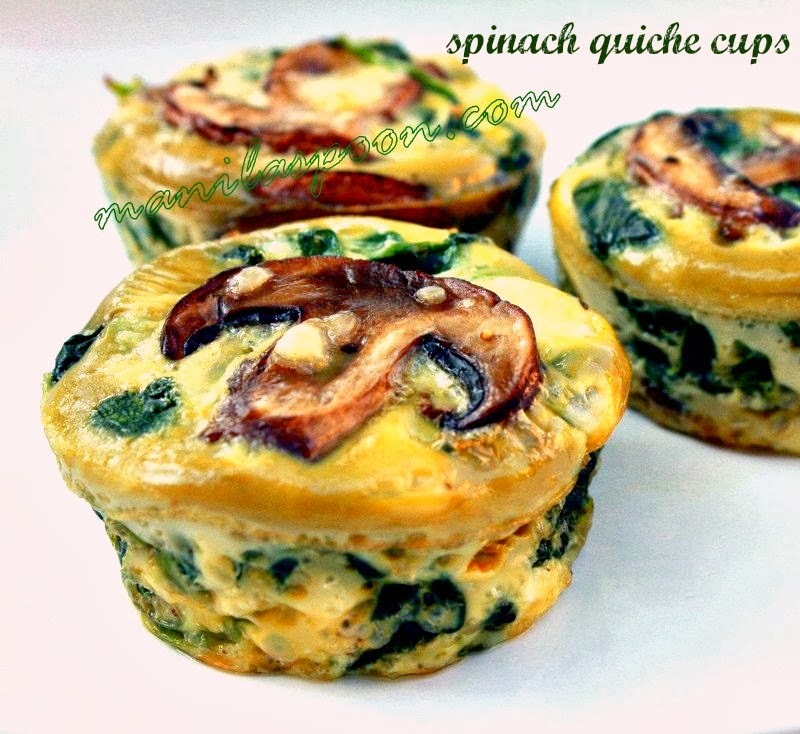 Hi, just came across your receipe and going to try it this weekend. I was wondering if i could skip the heavy cream? Thank you! Thanks and hope you enjoy it when you get the chance. Wow, this looks so beautiful. I only recently started using Matcha and I've been looking for recipes. This could be a winner.